“A man who knows the price of everything and the value of nothing” is Oscar Wilde’s description of a cynic (in Lady Windermere’s Fan). But does this mean the rest of us understand “value”? Ever tried to define the word “value”? It’s not easy. I’ve heard various tries, and one of my favourites is simply “something more”. The Oxford English Dictionary says value is “the regard that something is held to deserve; the importance, worth, or usefulness of something”. But this of course depends on who is regarding or using it. 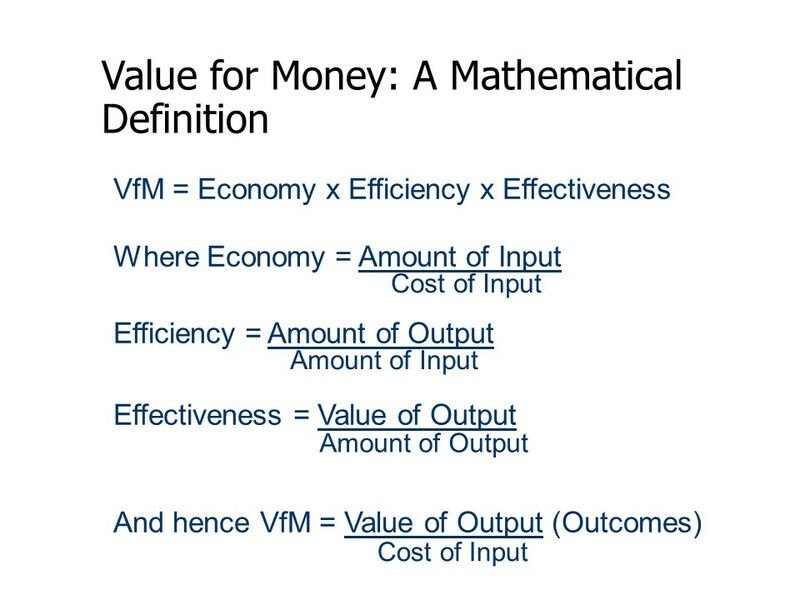 Even using a mathematical definition of Value for Money – see the illustration – we are left with value that could be intangible. Measuring outcomes – the difference something makes – is the start. We can usually say whether an outcome is better or worse, and sometimes measure by how much. 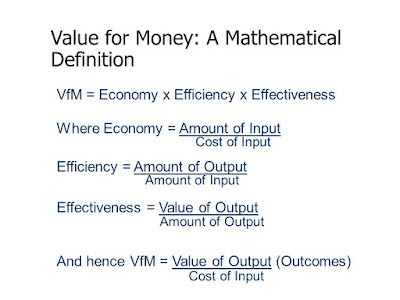 But “value” implies that we have invested something to achieve that outcome, and that investment is usually financial. Hence the approach of Cost-Benefit Analysis (CBA) and Social Return on Investment (SROI), which put numbers and £ signs to these outcomes. However rigorously these methods are applied though, doubts can arise about the financial values assigned to outcomes. I’ve often been asked if there’s a single all-purpose directory of valuations. It’s an understandable question, and the world might be a simpler place if there were, but the answer is no. There are many sources that list potential valuations, but these give different possibilities – sometimes even within the same source. 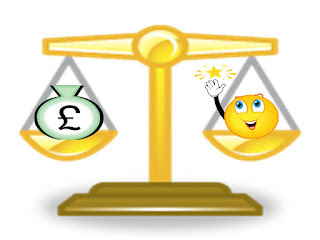 For example, consider what should be a fairly straightforward example: the cost of keeping a child in Local Authority residential care (hence the value to a Local Authority of avoiding this). I’ve just done a quick check of different sources and found a range of figures between £131,000 and £165,000 per year. Take something more intangible, such as the value to someone’s well-being of participating as a volunteer, and it’s not surprising that possible valuations vary even more. More important, I don’t think there should ever be a single valuation. Value, like beauty, is in the eye of the beholder, and context is critical. My SROI analyses consider a range of possible valuations from different sources. Then, in consultation wherever possible, I’ll select which of these most closely reflects the change we’re dealing with. It should give the most robust answer, but it’ll never be a perfect one. This is one reason why SROI ratios are approximate, and best expressed as a range: between £x and £y of social value per £1 invested, rather than exact figures. This also highlights the real ‘value’ of this kind of valuation. 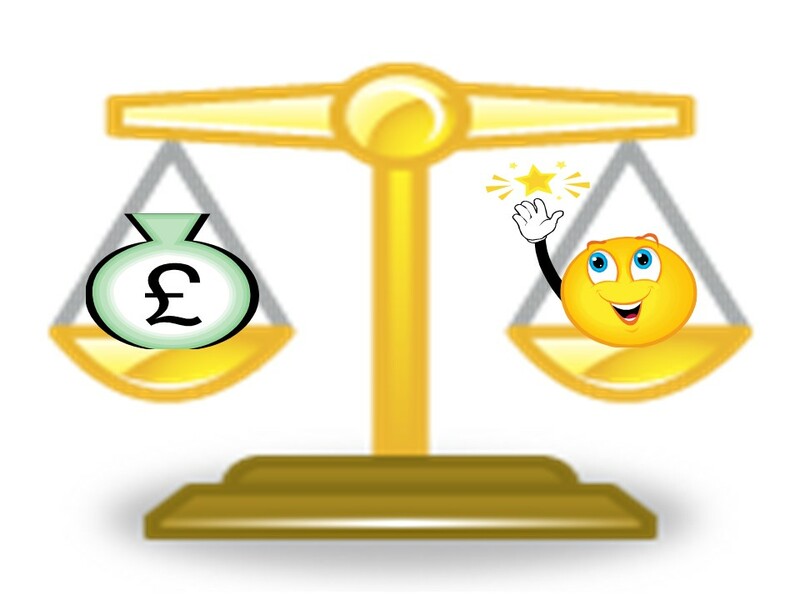 “£x of social value per £1 invested”, even if fairly accurate, is simply information. But if we can say how to increase that ratio to get double the social value per £, then that’s real knowledge. It tells an organisation what it could do differently to increase its impact. That’s why evaluation – SROI and other methods – must be about improvement as well as confirming achievement. That, to my mind, is the real value of value.